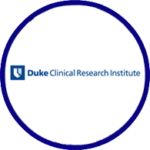 The Duke Clinical Research Institute (DCRI), part of the Duke University School of Medicine, is the largest academic research organization in the world. Its mission is to develop and share knowledge that improves the care of patients through innovative clinical research. The DCRI conducts groundbreaking multinational clinical trials, manages major national patient registries, and performs landmark outcomes research. DCRI research spans multiple disciplines, from pediatrics to geriatrics, primary care to subspecialty medicine, and genomics to proteomics. The DCRI also is home to the Duke Databank for Cardiovascular Diseases, the largest and oldest institutional cardiovascular database in the world, which continues to inform clinical decision-making 50 years after its founding.